Director – Stephen Herek, Screenplay – John Hughes, Based on the Novel The One Hundred and One Dalmatians by Dodie Smith, Producers – John Hughes & Ricardo Mestres, Photography – Adrian Biddle, Music – Michael Kamen, Visual Effects – Industrial Light and Magic (Supervisor – Michael Owens), Mechanical Effects Supervisor – George Gibbs, Special Effects Supervisor – Steve Hamilton, Animatronics – The Jim Henson Creature Workshop (Supervisor – John Stephenson), Production Design – Assheton Gorton. Production Company – Disney/Great Oaks. Videogame designer Roger Dearly meets Anita Campbell-Green, a clothing designer for the House of DeVil, while walking his dalmatian Pongo in London’s Hyde Park. Pongo takes a liking to Anita’s dalmatian Purdy and romance sparks between both humans and dogs. Roger and Anita marry and shortly after the two dalmatians deliver a litter of fifteen puppies. However, Anita’s boss Cruella DeVil is fanatical about fur and wants to buy the puppies to make a fur coat. When Roger and Anita refuse, Cruella has hired thugs break in and abduct the dalmatians. During the 1990s, after the success of Steven Spielberg’s live-action Peter Pan (1953) sequel Hook (1991), Disney and other studios hit onto the idea of conducting live-action remakes of Disney’s animation back-catalogue. So far this has given us remakes of The Jungle Book (1994), this remake of One Hundred and One Dalmatians (1961), Maleficent (2014), Cinderella (2015), The Jungle Book (2016), Pete’s Dragon (2016), Beauty and the Beast (2017), Aladdin (2019), Dumbo (2019) and The Lion King (2019), plus Disney conducting remakes and revivals of live-action films such as That Darn Cat (1997), Flubber (1997), The Parent Trap (1998), Freaky Friday (2003), Herbie: Fully Loaded (2005), The Shaggy Dog (2006), Race to Witch Mountain (2009), Tron Legacy (2010) and Mary Poppins Returns (2018). The live-action version of One Hundred and One Dalmatians is a lavishly mounted production. Director Stephen Herek is clearly a tourist to England and shoots London for maximum scenographic value – locations take up all of Hyde Park and Trafalgar Square. One has never much liked Glenn Close as an actress – she is far too cold and remote – but here, decked out in an eye-popping series of costumes and swanning about an array of monochromatic sets, she chews the scenery in grand style. The film is particularly good in the latter half where Stephen Herek achieves a seamless mix of real dalmatians, CGI and animatronics and snowy countryside and studio interior. Unlike the animated version, the remake does not allow the animals to speak and instead concentrates the story on the humans. As a result, the film lacks the anthropomorphic delights of the original, while sequences such as the All Dog Alert and the climactic flight lack the same impact or even meaning they did first time around. The puppies are played for all the expected cuteness, which is bearable enough bar one overdone scene with Jeff Daniels seemingly bringing one of the puppies back from the dead. Unfortunately, what turns one off about 101 Dalmatians is the latter half, which descends into slapstick – the good human characters (Jeff Daniels and Joely Richardson) drop out of sight altogether and the only three people on screen are Glenn Close and two sidekicks who are made the butts of a prolonged and extraordinarily sadistic series of slapstick set-pieces wherein they are variously dumped into molasses, icewater, pigshit, electric fences, through floors, are incinerated, blasted with exhaust fumes and so on ad infinitum. The film is making a clear attempt to emulate similar antics in the hit Home Alone (1990), which also came from producer/screenwriter John Hughes, the director of The Breakfast Club (1985). One understands that in the simplistic moral worldviews that kid’s films operate on villainy always needs its comeuppance but one cannot help but wonders what unconscious message it sends out when an audience is being actively invited to cheer on the prolonged torture of criminals. 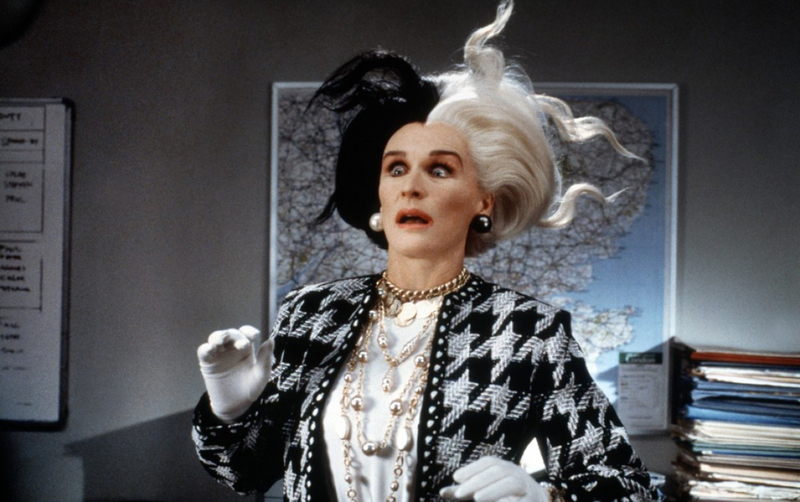 101 Dalmatians was a popular hit and Disney brought Glenn Close back for a likeable sequel 102 Dalmatians (2000), which is much more enjoyable than this film. There was also an animated tv series 101 Dalmatians (1997-8). Director Stephen Herek has made a number of other films, usually in the vein of light mainstream comedy. These have included Don’t Tell Mom the Babysitter’s Dead (1991), The Mighty Ducks (1992), The Three Musketeers (1993), Mr Holland’s Opus (1995), Holy Man (1998), Rock Star (2001) and Man of the House (2005). Stephen Herek’s other genre films include Critters (1986), Bill and Ted’s Excellent Adventure (1989) and the fantasy romantic comedy Life or Something Like It (2002). (Nominee for Best Actress (Glenn Close) at this site’s Best of 1996 Awards).